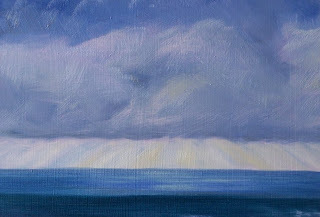 At the Pacific coast this past Saturday morning, clouds hung heavy. Light filtered through and it was cold. By Sunday, the clouds had lifted a bit, and by Monday, it was a beautiful day. This little painting was based on my vision of Saturday morning. 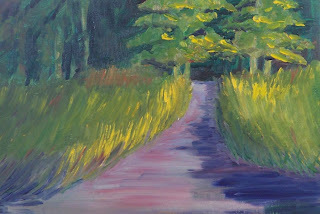 This little painting represents a trail into the woods at dusk. The Snake Lake Nature Center in Pierce County, Washington State is surrounded by nature trails like this one. 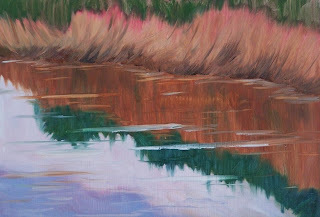 This is a reflection in a marsh from a photo I took last fall. I'm still playing with trees. 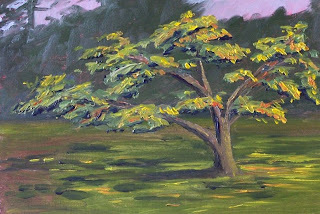 As I painted this tree, I tried to follow the methods of some of the well-known plein aire painters. 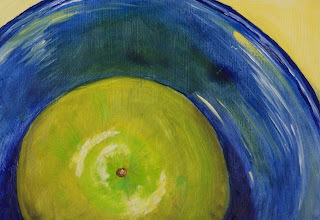 Kevin Macpherson and Richard Schmidt both recommend beginning with large blocks of color, painting shapes, and squinting your eyes. I should have taken some process photos of this one so you could see what I am talking about. I'll plan to do that with my next tree project. I'm going to approach it with the same method. 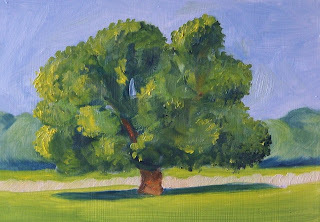 I hope you enjoyed looking at my latest tree study. Main artist Laura Taskeiko has tagged me! It's a blog game of tag amongst artists. These are the tagging rules:1. List 7 random facts/habits about yourself.2. Choose another 7 bloggers to tag and list their names in your blog. 3. Leave your 7 tagged bloggers comments to notify them of their tagging and to direct them to your blog for tag instructions. I want to visit the Chicago Art Institute. I like to paint with bright pure colors. I must have cadmium lemon yellow on my palette. I prefer to visit the ocean over the mountains. I love dogs, but I don't own one. The last book I read was The Glass Castle by Jeanette Walls. Do you think that's random enough? 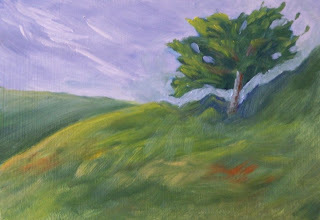 Here is another tree study. This little tree is one of many that line the road to the Veteran's Hospital at American Lake, Washington State. There are tall Douglas fir trees all around and these small yellow-leaved trees act like sunshine in the forest. Trees are going to be my focus for a while. 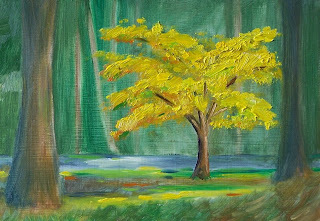 There are so many kinds of trees and they can be a challenge to paint, so I'm going to be doing a series of trees in a variety of styles. If I like some of these studies, I will eventually turn my work into a larger pieces. For now, I hope you enjoy my studies. 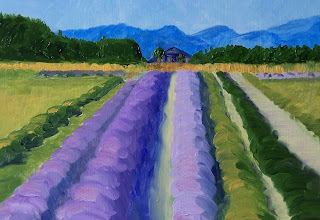 This little painting is of some of the lavender fields in Sequim, Washington State. Sequim is considered he laveder capital of North America. If you are ever in the area, you might want to tour one of the farms. Here is a link that gives you some information on the farms. The Sequim Lavender Festival takes place in July. Here is a link with information about the festival. 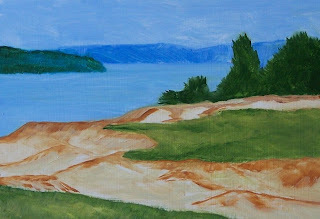 This is a painting of one of the greens at the Chambers Bay Golf Course that will be opening next month in Pierce County, Washington State. It is located about 40 minutes south of Seattle. Even if you aren't a golfer, you will love the views. You can learn more about it at this link. 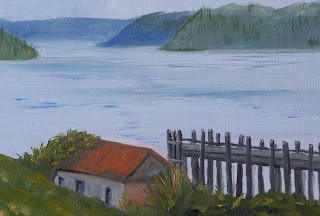 At the bottom of the Soundview Trail in Pierce County, Washington State this little shack sits next to an abandoned ferry dock. There are great views on this trail. I hope you enjoy this little glimpse. 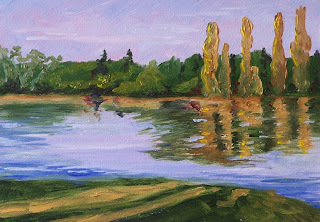 This little painting is based on a photo I took last fall in a park near my house. It was late afternoon and the sun was already starting to drop. It left shadows on the ground and fall reflections on the surface. 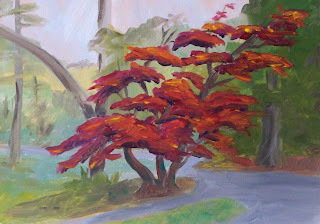 This little painting is based on a photo I took early one evening last fall in the park near my house. The sun was going down and flickered little shadows on the autumn leaves. Last weekend the Soundview Trail opened in western Pierce County, Washington State. It circles the new Chambers Bay Golf Course which opens in six weeks. Magnificent views abound. I'm not a golfer, but I can imagine this will be a delightfully popular destination when the course opens. Winding through groves of alder, paralleling the shores of Puget Sound, venturing past the ghostly remains of an old gravel processing plant, and finally meandering back up the hill where the trail begins was an exciting adventure. I took about 80 pictures; this painting is based on just one. 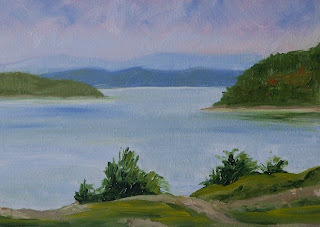 Just before we reached the portion of the trail that parallels the shoreline I paused and took a snapshot. From here one can see the southern tip of Fox island, the northern stretches of Anderson Island, and the Olympic Mountains in the distance. 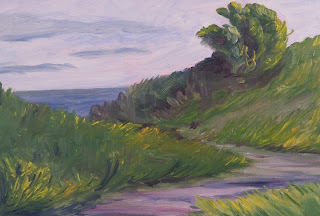 I'm anxious to paint more studies based on my adventure on the Soundview Trail. On a walk this weekend, I snapped a photo of this beautiful red-leaved tree. It is evidently a very old tree that grows just outside the pagoda at Point Definance Park in the Japanese gardens. I loved the flaming red of the new leaves and how they seemed to shout for attention. 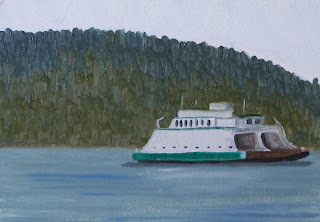 This is the Washington State Ferry, The Rhododendron, as it crosses Puget Sound to Vashon Island. 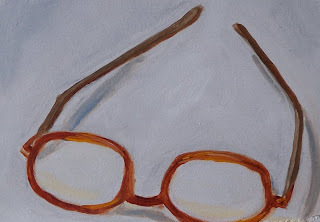 This morning as I sat contemplating the blank canvas, my reading glasses stared back from the tabletop. Since I couldn't find inspiration elsewhere at the moment, I painted them. The light was diffused with simple shadows and subtle highlights. I'm going to go back to my studio and contemplate something else. Inspiration is fleeting today.